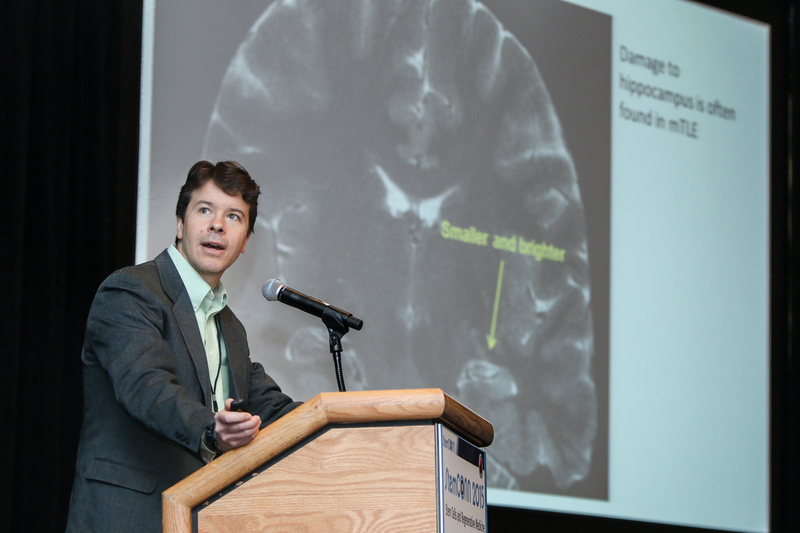 Gloster Aaron, associate professor of biology, associate professor of neuroscience and behavior, spoke at StemCONN 2015 in April. Wesleyan faculty members played key roles in StemCONN 2015, Connecticut’s stem cell and regenerative medicine conference, held April 27 in Hartford, Conn.
Janice Naegele, professor of biology, professor of neuroscience and behavior, director of the Center for Faculty Career Development, served on the conference’s organizing committee for the second time this year. Gloster Aaron, associate professor of biology, associate professor of neuroscience and behavior, spoke at the conference on “Investigating how transplants reduce seizures: brain slice electrophysiology and ontogenetic stimulation of transplanted cells.” He discussed the collaborative work being done by his lab and those of Naegele and Laura Grabel, the Lauren B. Dachs Professor of Science and Society, professor of biology, which aims to heal damaged areas of the brain that are the source of seizures in temporal lobe epilepsy by providing newborn neurons to those areas. The goal is for the newborn neurons to replace dead neurons and repair broken neuronal circuits that are thought to be a cause of temporal lobe epilepsy. Nearly 500 scientists, business leaders and students attended the event, which is held every two years. The event was also attended by many Connecticut officials, including Gov. Dannel Malloy, U.S. Sen. Chris Murphy, U.S. Congresswoman Rosa DeLauro, Connecticut State Rep. Lonnie Reed, and Hartford Mayor Pedro Segarra. The conference was sponsored by Wesleyan, as well as Yale University, the University of Connecticut, the Connecticut Academy of Science and Engineering, Yale-New Haven Hospital, the City of Hartford, and other companies and non-profit organizations.